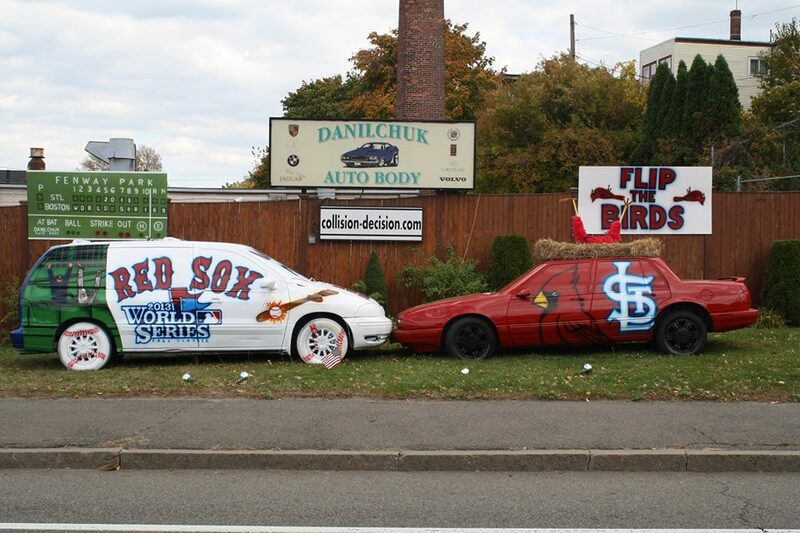 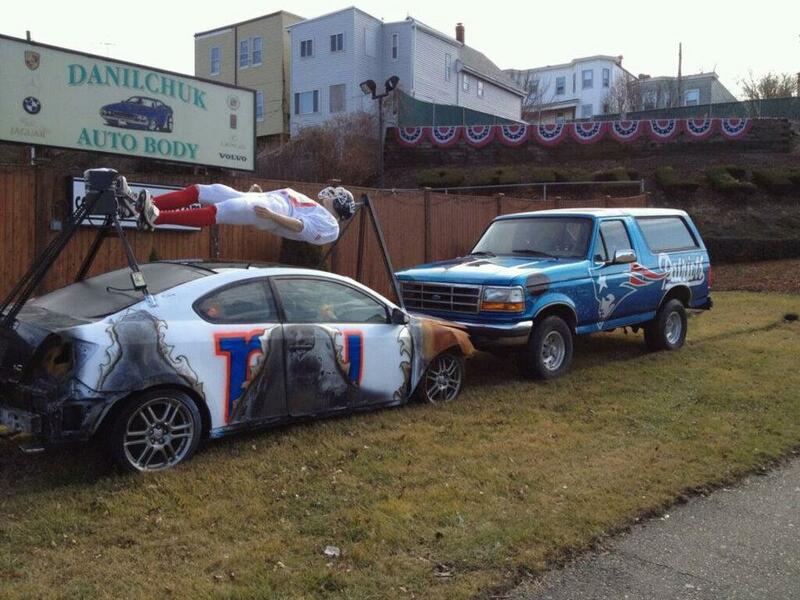 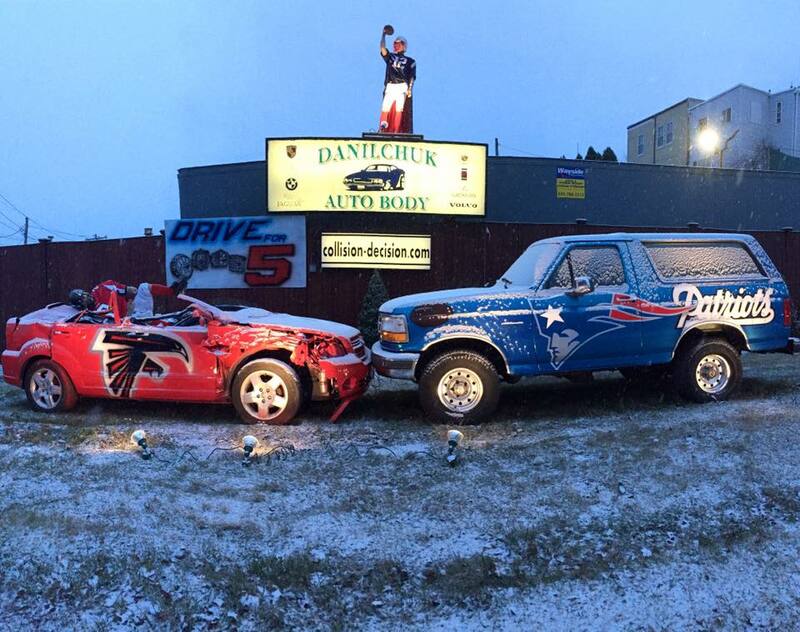 As the Patriots head back to the Super Bowl against the Los Angeles Rams this Sunday evening, Danilchuk Auto Body has put up a display, titled “Brady’s Ram Hunting Camp,” out on the lawn facing the northbound side of Route 1A, at Addison Street in East Boston. 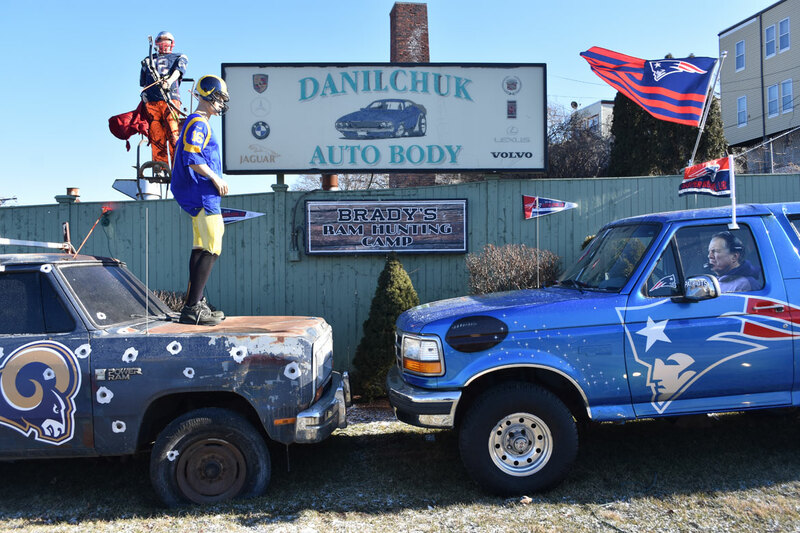 A blue Bronco with Patriots coach Bill Belichick at the wheel has (apparently) crashed head on into a pickup speckled with bullet holes. 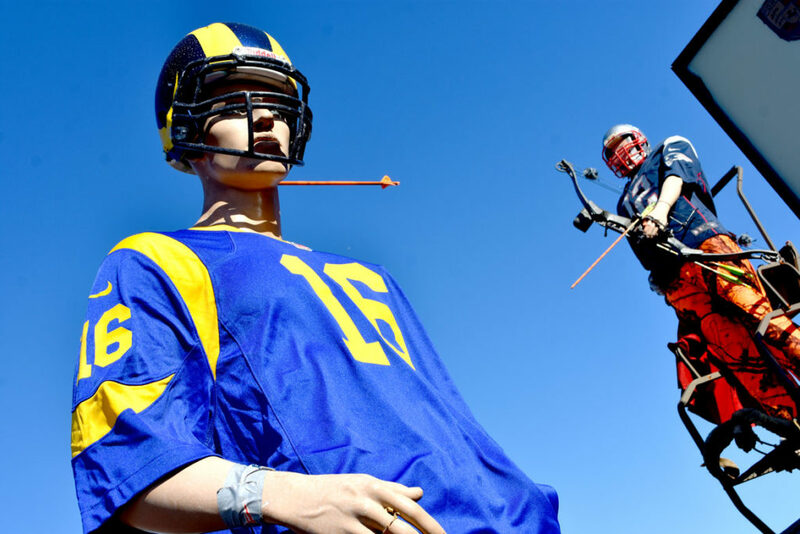 Along the side of the truck, they’ve painted “Let’s Go Ram Hunting.” A mannequin depicting Patriots quarterback Tom Brady stands upon a platform with a bow and has shot an arrow into the back of the neck of Rams quarterback Jared Goff. 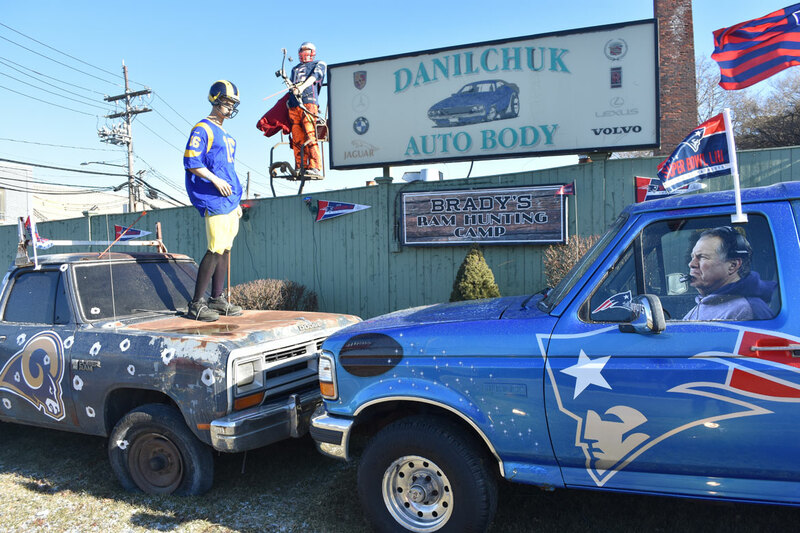 The auto shop has been celebrating Boston sports championship runs this way since the New England Patriots faced the Green Bay Packers in Super Bowl XXXI January 1997. 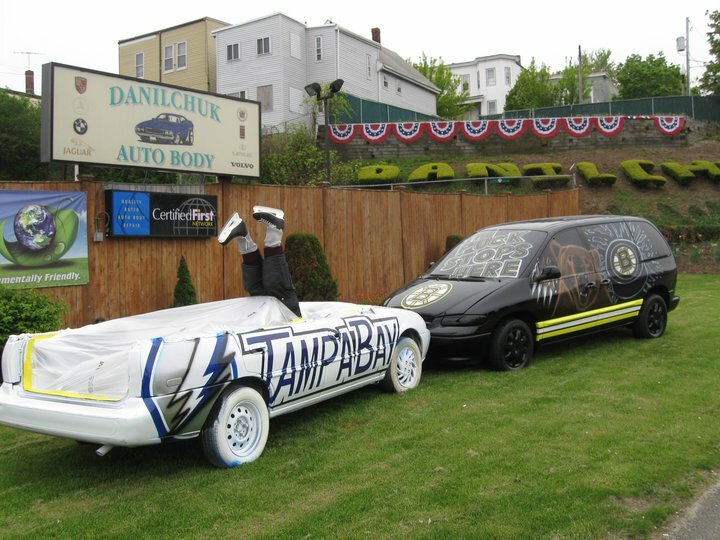 “It was a huge hit,” says Eric Danilchuk Jr., whose father Eric Sr. started the company. 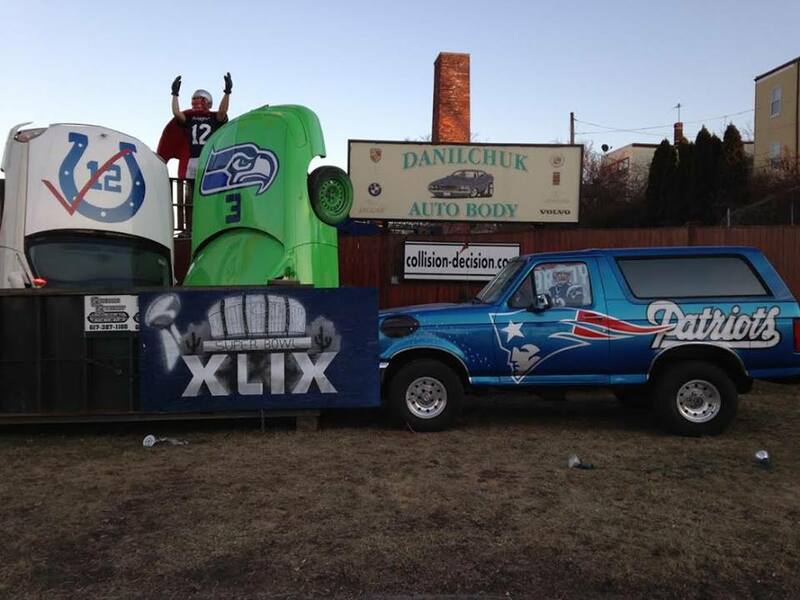 “The customers loved it.” Even though the Patriots lost 35 to 21. 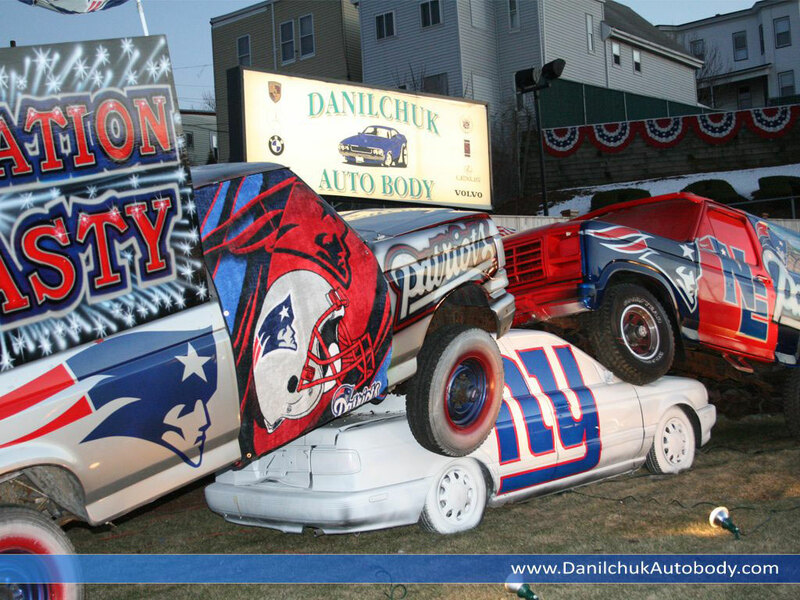 So they’ve done a new one for each Super Bowl, a couple AFC championship games, and some Red Sox, Bruins and Celtics playoff runs. 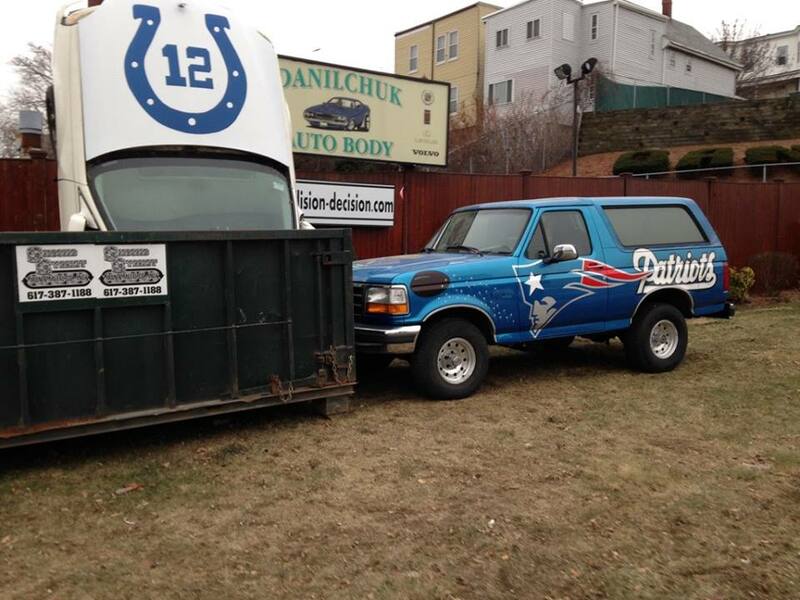 “All of a sudden the Patriots win and you start brainstorming,” Danilchuk says. 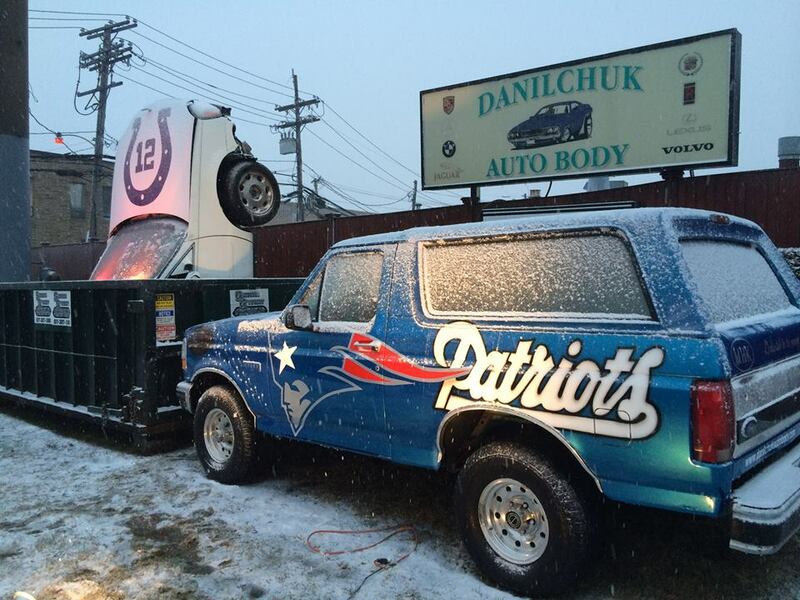 “Last year, it was pretty controversial,” Danilchuk says. 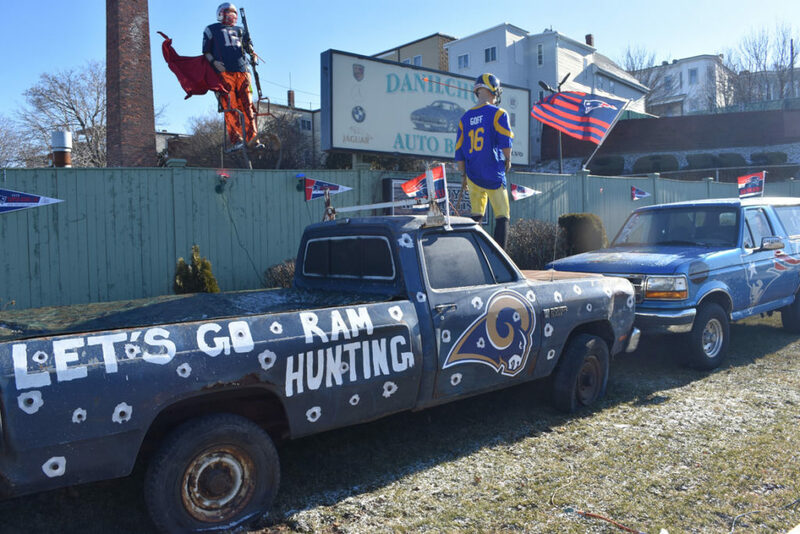 “We put Philadelphia in a funeral.” They had the Patriots Bronco crushing an Eagles van painted with tombstones and the Grim Reaper. 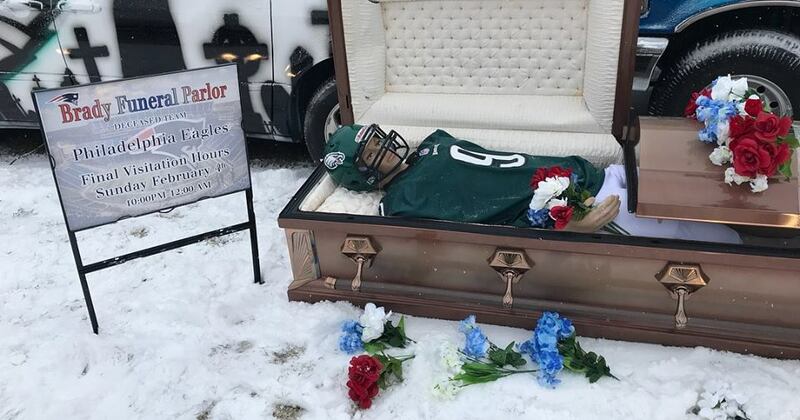 Eagles quarterback Nick Foles lay in a casket on the grass in front. 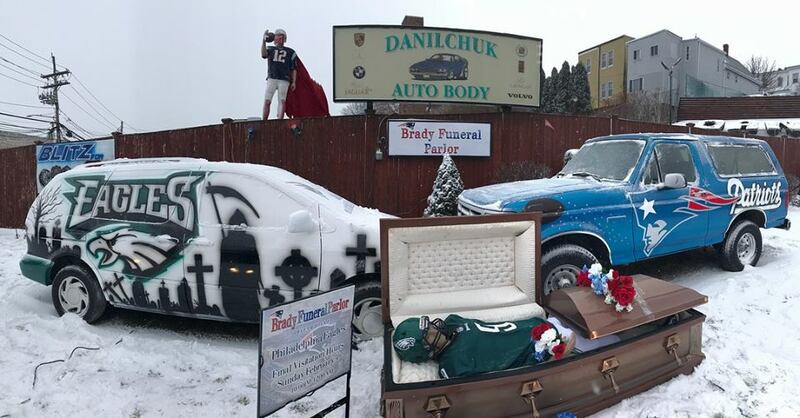 Despite the “Brady’s Funeral Parlor” display, the Patriots lost 41 to 33. 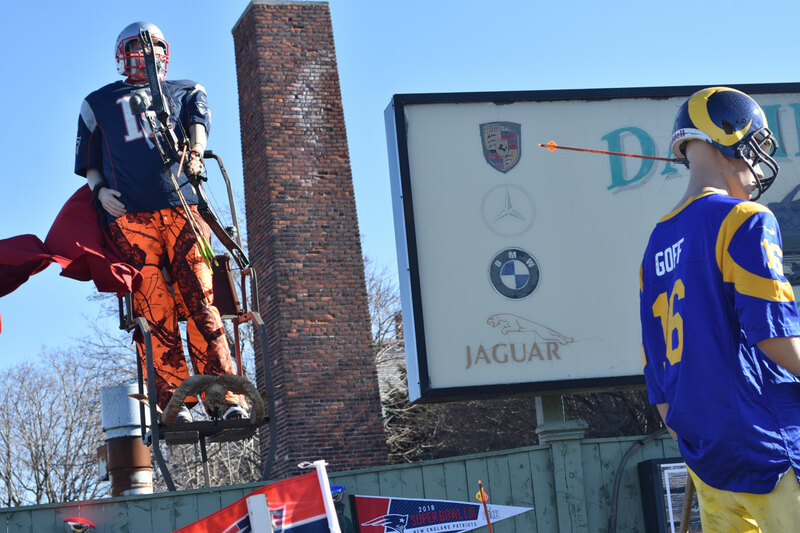 • Welcome Guests To Your Home With … A Bill Belichick Door Knocker?